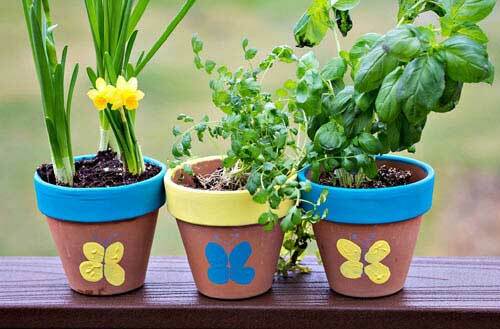 Painting Terracotta Pots is just one of the many ways you can use them in crafting projects and garden or indoor decor. 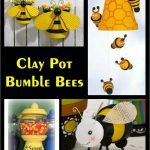 The basic Terracotta pot is surprisingly versatile and an extremely popular item when it comes to crafting and garden decor. 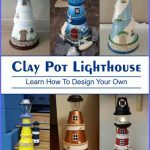 If you go to Pinterest you can find hundreds of examples and projects for you to try. Some even have excellent tutorials. Some with links for you to purchase the completed projects. 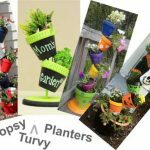 Terracotta or clay pots also rank amongst the cheaper types of planters you can buy. 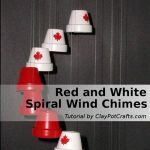 This makes them an excellent choice for crafting, especially if you are a beginner and just learning. If you want your amazing art project to last and look good for years to come you must prepare your pots properly first. If you intend to paint your pots you need to realize that Terracotta is extremely porous, meaning that it absorbs moisture rapidly. If you don’t seal it the pot will retain moisture from the soil inside and seep through to your design and ruin it. Also, your paint may seep through and kill your lovely plants within. So there are a couple of things you need to do before you begin. 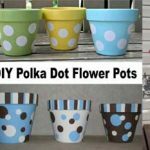 Even if you have just purchased your brand new pots from the garden center or craft store, you have to remember that they will be dusty from just sitting around. They may have sticky patches from dirty hands touching it and labels stuck on it. All of which will need removing, if you wish to paint or coat it in any way. To clean your terracotta pots soak them in clean warm water, do not use any soap. Let your pots soak for at least half an hour. Remove them from the water. Give them a good scrub with a stiff brush or sponge. Make sure you remove any labels, dirt, and grime. If you can’t get off all the dirt and labels re-soak the pots and try again. Keep doing this until the pot is thoroughly clean. If you are reusing an old pot, especially if it has been planted in you will need to add a dash of bleach to the water to kill off any mold and mildew, and take a bit more time on the cleaning process. If you have any unwanted lumps or bumps you can lightly sand them down with some light sandpaper. Once you have completely cleaned your pots rinse them off in fresh clean warm water and allow to dry thoroughly before moving on. This stage is extremely important if you want your project to stand the test of time. 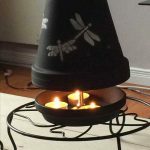 Your pot project needs to be totally dry and you will need to completely seal the pot inside and out. Make sure there are absolutely no gaps in the sealant. This will prevent moisture from soaking through and ruining your design. 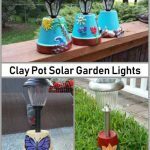 You can either spray your pot with a spray sealant or use a sealant that you can paint on the choice is yours. A sealant can be purchased online or from any craft store. However, the timing for this will depend entirely on the project that you are doing. With these cute little thumbprint pots by Upstate Ramblings you could add your design on your clean pot and then spray seal the entire pot inside and out to protect it. Coating it about 3-4 times for good measure. Whereas with this project using dip dying, there are two methods you can use. 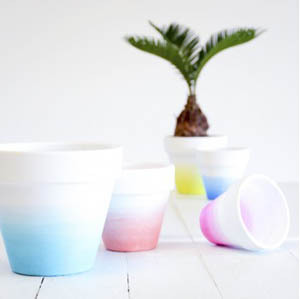 Method 2 – Dip dye your pot with watered down base coat completely submerging your pot. Then add the layers of color. Allowing each layer to dry before adding the next. Seal it with a clear matte finish sealer. This will give it a more textured, softer finish. 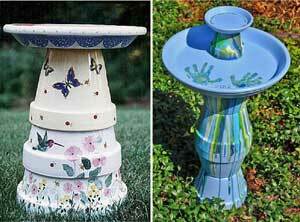 However, when you are joining pots together as in these beautiful Clay Pot Birdbaths. I would advise completely sealing the insides of all pots before joining together. Then making sure you properly seal all the joins. Otherwise, you may end up with a large growth of mold inside. 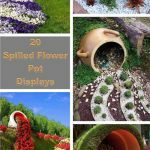 Don’t get me wrong mold is beautiful in the right setting as you can see in my article How to Create Your Own Beautiful Terracotta Landscape. It just doesn’t fit in with these types of project. 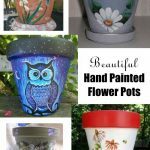 You can either spray your pot with a spray sealant or use a sealant that you can paint on the choice is yours. Sealants can be purchased online or from any craft store. You can use any sealer that can be used on porous surfaces such as clay or concrete. Remember you may need to give the pot 3-4 coats because of how porous Terracotta is. 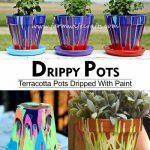 Allow pots to dry completely between coats and before painting. 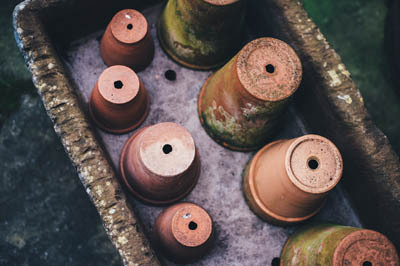 Now that you know how to prepare before Painting Terracotta Pots you are ready to begin some projects of your own.